Kids can be somewhat forgetful when it comes to completing their chores. Sometimes it’s intentional; other times – not so much. Your kid will have no excuse now, though, for not knowing what is expected of him or her. 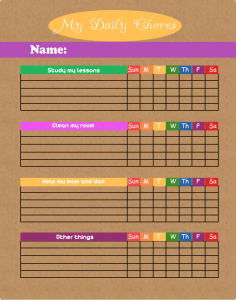 The chore charts available in our free printable activities at PrintablesFree.com are designed to help your child easily manage and track their weekly chores. Each chart is colorful and can be customized with your child’s name and picture, if you desire. There’s no need to print out multiple chore charts every week, either. Below, we’ll show you how to print one for each child and use it again and again. If you’re ready to show your kids how to manage their time, complete their chores and still have plenty of time left for leisure and study, keep reading! Finding the perfect chore chart isn’t easy. Some are organized in such a way that it’s not easy to see the entire week at once. Some come prefilled with so many chores that there’s no room for personalization. Still others are just plain and boring. You’ll have none of those problems with our free printable chore charts. These are bright and colorful with bold designs that are sure to keep your child’s attention. While there are pink, blue and purple designs, we also have a couple of gender-neutral designs, too. Some chore charts are completely customizable with only the days of the week and the column for the list of chores. Others provide different categories of chores with plenty of room for the chores to be added underneath. All of the designs are easy to use and customize according to your needs. One of our most popular downloads is the brown free printable chore chart. It is gender neutral and includes the following colors: brown, yellow, purple, green, red, blue and more! There are four categories for the chores: study my lessons, clean my room, help my mom and dad, and other things. Each category has five spaces underneath to add individual chores. This chore chart is perfect for older children and teens that have a bit more responsibility than youngsters under the age of eight or so. To create reusable chore charts, simply print off your favorite chart on thick cardstock. Either laminate the sheet or place it in a thick, quality plastic sheet protector. If your child’s chores are somewhat permanent, go ahead and write them on the paper before slipping it into the sheet protector. If they change, wait until the paper is protected. Using a dry erase marker, you can add chores and have your child check off each day the chore is completed. At the end of the week, erase the plastic sheet and you’re ready to go again!